Another day in Hong Kong and another series of adventures . 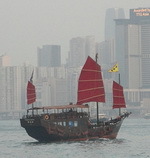 . . but even though Ross and I set sail on a ferry, and spotted a cool-looking junk, we didn't see any pirates. We did see a lot of pirate activity, though, with the constant assault of street vendors offering to sell us "copy" watches and "copy" handbags. And that doesn't even count the vendors who weren't quite so honest with their fake iPods and Rolex watches. Or the occasional "copy" games that were stacked on the tables in the street market. Today is another round of meetings, this time with a rep from the factory that produced Revolution! and an engineer who worked on one of Steve's favorite toys, the marbleous Chaos Machine. And around those meetings Ross and I will work our way through the 2,000 booths at Hong Kong Toy Fair. It's gonna be another great day.